Benjamin Bankole Bello (BBB or Triple B) a.k.a Obonjo is based in the United Kingdom and is of Nigerian Parentage. Born in the UK he has always had a passion for Comedy right from when he was a kid. Obonjo created Smile Productions and Obonjoart productions in 2007. Obonjo is a father of three, and a legal resident in England. Without mincing words or sheer abuse of semantics or syntax, Obonjo, ''the Presidential comedy character'' has described comedy as the only panacea to long life and sound health especially at this period when economic recession has posed itself as another deadly scourge in human life, after the pandemic HIV/AIDS. He sees comedy as a core business meant for the serious minded ones, pointing that the task requires research and hard work; no doubt that thoughtful disposition of his has positioned him to be unique in the field, and has made his teeming fans to describe him as an intellectual comedian with unparallel virtues. 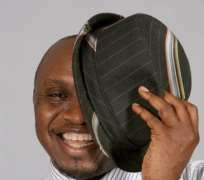 Obonjo expressed himself extensively in this precise rib cracking online interview with Emmanuel Ajibulu. Yes you can, I believe we have already met. (LOL) that sounds very spookey. My name is Benjamin Bankole Bello. I was always the jovial one in the family, never able to stay still, always playing pranks, cracking jokes. Even at an early age I knew laughter was the best medicine. I remember when I was about 10 years old; a woman approached me and said I had a lovely smile and that it would open doors for me. When I moved to England many years ago, I met a friend who gave me the name Obonjo. We shared our dreams for our future and I used to meet people who would meet me for the first time and say I need to be on stage. At parties I would make people laugh with tears rolling down their cheeks. I attended one of the best secondary schools in Nigeria in those days - Government College Ibadan and finished my higher education in England. Some have said you are unique and that you are an intellectual comedian how would you react to that? Wow that's an honour, I guess there are messages they pick up from my jokes. When I was very young, I saw myself as a Politician, sub-consciously I still have this dream. I am well known as President Obonjo of Laughter Republic some of my jokes are not meant to be Political but they do have messages that have an impact on people's lives. What would you want to share with your fans both in the Diaspora and in Nigeria? Just to say it's never too late to follow your dream and to thank fans for their support am nothing without them. Any regret so far since you started this comedy business? No regrets at all. It's been an incredible journey one could argue that I should have started this earlier but you know what? God's time is the best. Comedy is my passion and my life. My vision is to create happiness and fun in people's lives. Tell us about your first experience with the audience as a stand up comic? Well, that was such a long time ago. Whilst it was a nervous experience trying to make a 100 people laugh, my trade mark my smile did the trick for me. I love human interaction; it was nice to see a few friendly faces. How do you get your jokes? What makes a good comedian? You need to get people to laugh at your jokes, do your research to share about day to day experience. Do you have a mentor in the industry? No Mentor, but I am hooked on Basket Mouth, Gandoki, Klint the drunk and western influences - Chris Rock, just to mention a few. As a person, what makes you laugh? When am around like-minded and fun loving people it makes me laugh. People cracking jokes and responding to my jokes. Apart from comedy, what else do you derive joy doing? I also paint, I am an abstract artist. I specialize in Abstract Art and had great passion for it but always knew I would end up in Comedy when the time was right. Have you ever cracked a joke in a gathering and nobody laughed. Tell us how you felt? Well, that has happened a few times. The way I got out of it was to pick on a member of the audience and engage in the next round of jokes. My feelings were shock, denial, relief and welcoming the response. You are never going to please everybody. What's the most stupid and craziest thing you've ever done as a comedian? Well asking members of the public whether they have seen my wife even though my wife was next to me. It was a crazy reaction. What gives you an edge over others in the same line, and how can you be reached for business?